Iron is the most common material used in water transmission. Cast iron, cement-lined cast iron, and ductile iron are the types that have been widely used in the US. Some examples of galvanized iron are also reported. Failure rates for cast iron are about 5 times greater than for ductile iron, owing largely to differences in corrosion rate. Heavily tuberculated unlined cast iron pipe, Utility 2a. Note about one-half the interior volume has been occluded. 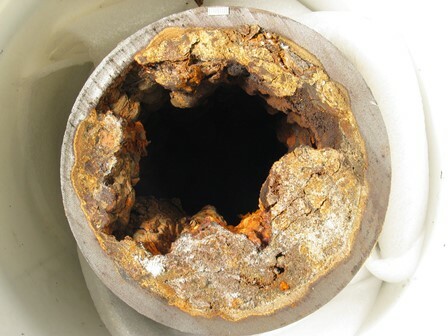 Newer pipes are cement-lined ductile iron to protect against this type of corrosion. Regulated elements (Cr, Pb, V) are quite low except in scales from galvanized pipes, although the sample set is small for that category. Other elements strongly enriched in galvanized pipe scales are Cd and Ni, each about 10x enriched. Note that Pb is nearly 100x enriched, which probably reflects the presence of appreciable Pb in the Zn coating on these pipes (see the galvanized iron page). Detailed study of a single distribution system gave similar results as shown in the next table. Illustrations of the textural types are shown on the tubercles page; discussion of the iron compounds on the minerals page. Some enrichment of the surface layer in Si, Al, and Ca occurs. These elements are probably contained in quartz and clay that have come through the treatment filters plus some precipitated CaCO3. Other textural components have about the same compositions. There is a distinct difference however between the open mains (mostly flowing water) and the fire hydrants (mostly stagnant water). The hydrant scales are strongly enriched in Sr and, to a lesser extent, Ca. Both are probably present as carbonates. See Gerke et al (2013) for more on Sr in distribution systems. Peng, C-Y., Korshin, G., Valentine, R., and Hill, V., (2010) Characterization of Elemental and Structural Composition of Corrosion Scales and Deposits Formed in Drinking Water Distribution Systems. Water Research Foundation Report 8038.